to celebrate Martin Luther King, Jr’s birthday, I thought today we would take another look at the LOVE design featuring the heart shaped Flag of the African Diaspora in the shop at zaz.flagnation.com or zazzle.com/flagnation. This design makes a lovely gift for Valentine’s Day, but also is great for honoring Black History Month. Wonderful, also, for Juneteenth celebrations. First up we have a laptop bag to make your life easier. Next, a neck tie for formal occasions, but when you want to smile. Third, to take and leave messages in your home, dorm or office, a dry eraser board should do the trick. And fourth, for organizing papers at the office or school, a lovely binder with the African American LOVE design in red. Just a few more shopping days until Valentine’s Day! HAPPY SHOPPING! My shop at print.flagnation.com or printfection.com/flagnation, carries a color combination of a women’s black and red tee that, I believe is stunning. As far as I know, Printfection is the only POD that carries this, so I thought I would share a few with you today. There is one baby’s item here, the rest are all for the ladies. And MAMA, you are gonna look HOT in your new stuff! 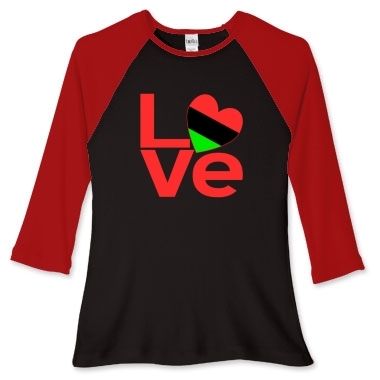 First up, is the Women’s Fitted Baseball Jersey with long red sleeves and a black torso, the design on this one is the African American LOVE design with red letters. And, ohhhhh, how sharp it looks on this shirt. You can purchase it for yourself or your favorite lady by clicking on the picture or clicking here. You can see all the items with this design by visiting this link. 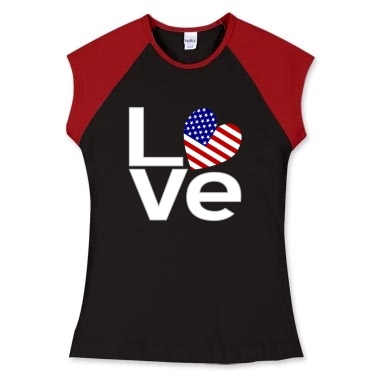 Next up, mama wants a cap sleeve tee with the USA LOVE design in white letters. Mama lookin’ hotter still! To purchase, click on the picture below or here. You can see all the items with this design at print.flagnation.com by going to this link. The blue lettered USA LOVE design doesn’t seem to look as great on the red and black t-shirt combos, so I chose a baby item to show it at its best. If mama wears the black and red combo on Valentine’s Day for her man, she just might need the baby duds in a little while. To plan ahead and buy the Girls Baby Rib T-shirt, click on the picture below, or click here. 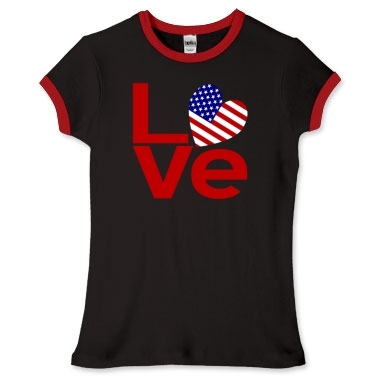 Our last shirt for mama is a women’s fitted ringer t-shirt, with, of course, the USA LOVE design in red letters. 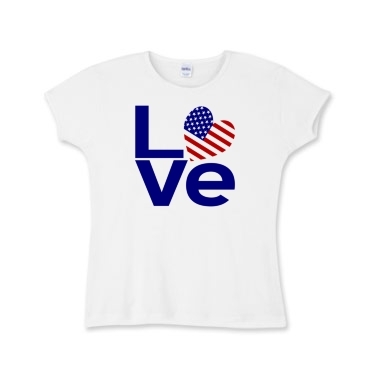 Perfect for Valentine’s Day, USA Patriotic holidays and any time mama want to look hot! You can purchase by clicking on the picture below or here. This concludes out tour for today. Remember only 32 more days until Valentine’s Day. And Black History Month (February) will be here very soon, too. Get your shopping done early and avoid extra shipping fees. HAPPY SHOPPING! Today we will look at stuffed animals at two POD’s, cafepress and inktastic. Cuddly, soft, and lovable stuffed animals make wonderful gifts for Valentine’s Day, birthdays, or any special occasion. But for Valentine’s Day they are really fun for that special lady or child in your life. First up we see a cuddly teddy bear with the African-American heart-shaped flag or flag of the African Diaspora. Since February is Black History Month you can also help your favorite Black American remember both Valentine’s Day and their ethnic heritage with this thoughtful gift. You can purchase this charming teddy bear by clicking on the picture of him below or click here. Next, we see our lovely Sully the Cow all decked out with the Italian heart flag. Charming, lovable, and sweet she will surely make a big impression on your favorite Italian lady no matter what her age. To buy Sally the Cow, click on the picture below that shows her wearing the flag of Italy heart or click here. Next on our list we have the Easter Bunny showing up early to celebrate Valentine’s Day with your Irish lassie or laddie. Our lovely bunny loves his Irish roots and his little heart flag. He will surely charm your favorite Irish person on Valentine’s Day, Easter, or even St. Patrick’s Day. To purchase our charming Irish Easter Bunny click on the picture below or click here. While this one is last, the last is never least and this is no exception. We just love Norway and this charming bull of many colors (colours, if you speak British). He will bring lots of love and cuddles to your favorite Norwegian all year round. To purchase our lovely bull please click on the picture below or click here. That concludes our tour of the stuffed animals available with various heart flag designs from our shops at ameriwear.flagnation.com and ink.flagnation.com. Remember, just about 30 shopping days till Valentine’s Day. So shop early to make sure that your gift is shipped in time for the big day. HAPPY SHOPPING! I will be posting many heart shaped flags between now and Valentine’s Day. Today, we look at some in the shop at skreened.com/flagnation, and a few others. First, as stated above, we visit skreened.com/flagnation and take a look at the heart shaped Flag of England. The English flag is also known as the Cross of St. George, or St, George’s Cross. It looks lovely here on a blue crew neck sweatshirt, certain to please your favorite Englishman or Englishwoman on Valentine’s Day or any special time. You can purchase any of the items by clicking on the picture. Keeping in the same geographic area, we are now looking at a heart shaped Flag of the United Kingdom and Great Britain, in the same shop. Also, great for your favorite Brit on Valentine’s Day, it is also a great gift for any anglophile on your gift list, including your good self. This particular item is from American Apparel, too. Next we travel to the shop at printfection.com/flagnation to visit the German heart shaped flag. 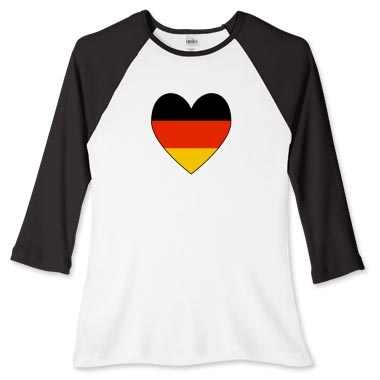 A simple design, again perfect for your favorite German or German American or anyone of German ancestry, heritage and culture. And, as always just wonderful for those that simply love Germany. 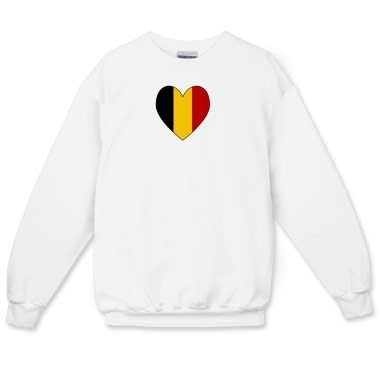 Also at printfection.com/flagnation, we have a long sleeved crew neck sweatshirt with a heart shaped flag of Belgium. Again, terrific for your favorite Belgian this coming Valentine’s Day or anytime you need a special gift for a loved one. Wonderful for travelers, too, who simply loved their trip or vacation. A truly fun gift for those that have everything and always stump you. That’s all for today! Thanks for taking a look at what I offer. And, remember just a little more than a month until Valentine’s Day. This design features an image of both Flags of USA and Armenia. It reads, “Armenian by birth American by choice”. Terrific for a new citizen or anyone whose mother country is Armenia, but are proud of their new home, too. This is available at the Inktastic shop of ink.flagnation.com. Many other items are also purchaseable with this image, including items for baby, infant, kids, men, juniors, and women. A large selection of stuffed animals with this image is obtainable here. Dedicated to all Armenians who have come to the United States of America and made it their home. WELCOME! Make your dreams come true and love both your new and old countries. Honor your new and old cultures, ancestries and heritages. They are part of you.